I seem to be obsessed by snails. My last recipe was a snail recipe…. and then 6 months later and yet another snail recipe. Why are snails so cool you may wonder, well let me tell you….They move slowly through life carrying their tiny shell house as their protection. They are kind of unattractive and a bit chewy. But they taste really good when all the other ingredients are just right. I have moved 5 times in 9 months…and I have learnt to carry what I need with me. My children, life’s necessities, all the basics you need just to live really. Life is a funny thing. When you think you are safe with your home on your back, quite suddenly you find yourself, shell-less. So, I have been quietly growing a new shell – just like a snail would do. I present my new shell – a 700 year old medieval village. Full of history and stories that I feel surround me and hold me close so that my story does not seem so big after all. Not in the really big scheme of things anyway. I feel my place here and it is just a moment in time. Not too bad at all! So with my new shell in place I begin again and offer you my new profile: I an 38 years old. I am a mother of 2. I am now a manager of a venue that can sleep nearly 100 people and I cook for them all regularly. I have been quiet for a while and some of my readers have been kind enough to ask me why? Well, the answer is because life is a journey, like the travels of a snail. Slow but determined. What may not seem like much to some, is in fact far to go. So I offer my respect to the snails. Now let’s eat some!! Start by cooking your onions in the oil for a few minutes. 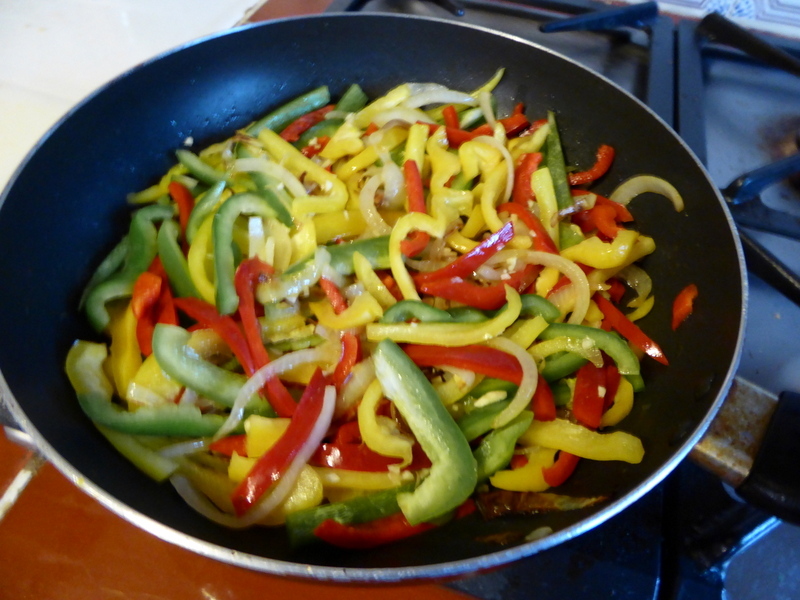 Then add the peppers and cook for 5 minutes. Cover the pan and let it simmer on low for 10 minutes. Such lovely colours! Now add the chopped tomatoes, sugar and garlic and simmer for 20 minutes, stirring from time to time. Then add your chorizo and cook for 5 minutes. And finally the snails, drained. Cook for 5 more minutes and season to taste. Serve with lots of lovely bread to mop up the juices. 12 Comments on "Respect to the Snails! 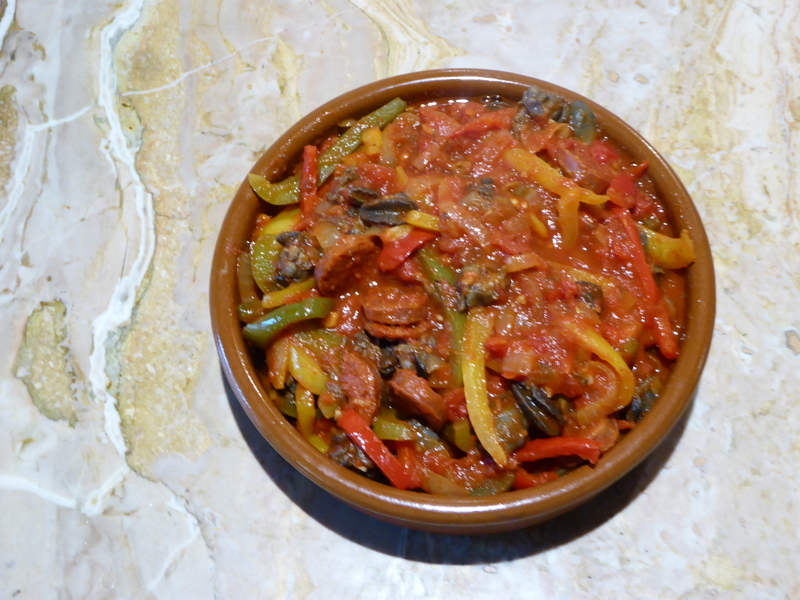 (with peppers and chorizo!)" Glad you are on the slow road back to cooking and writing and living! Wow- moving 5 times is 9 months! Welcome back to blogging, I was wondering where ‘you went’! Yes, snails are a bit chewy and it’s interesting to note that you can’t just go and eat any old snail out of the garden- they need to be specially harvested. Good luck with your new job and Merry Christmas to you and your family! Gosh, moving so many times in such quick succession. I don’t envy you one bit. I hate moving… hate hate hate! 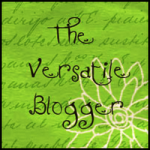 I’ve been easing back into blogging myself. I was gone for so long and I must admit it’s hard to get going again. I feel like I neglected all the sites I normally so love reading, so I thought I must stop by to see how you are and also wish you a merry Christmas! Be brave!! They really are good! I am happy you like the look of my recipe – I aim to try to use snails in ‘out of the ordinary’ ways and this one really does work!